Visit us at our facility in Plymouth. We will be happy to set up an appointment. Directions to our plant follow. You are driving on the highway I-275. Take I-275 North or South to M-14 highway and head West bound (towards Ann Arbor). Exit at the first exit, which is called Sheldon Road (Exit 20). Please read now the paragraph “... coming from Exit 20”. You are driving on the highway US-23 or M-14. Take either US-23 or M-14 east bound (towards Detroit). Exit at the Sheldon Road exit in Plymouth (Exit 20). You are driving on the highway I-96. Take I-96 east bound and remain on that highway until it turns into M-14 at the I-275/I-96 junction. At the stoplight, turn left and head South on Sheldon Road. Our street is the first street to come up on your left (Plymouth Oaks Blvd). Turn left into the Plymouth Oaks Business Park and head east on Plymouth Oaks Blvd. 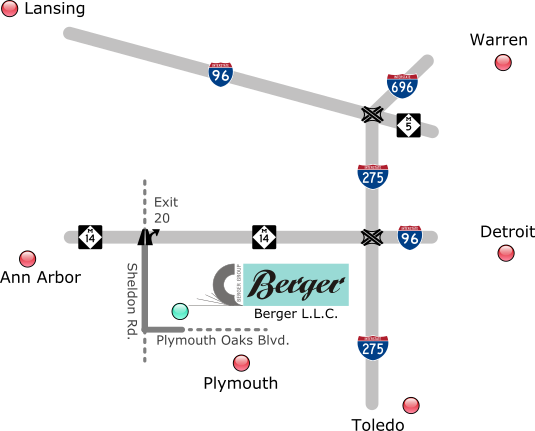 BERGER L.L.C. is located at 44160 Plymouth Oaks Blvd., the fourth building on the north side of the street. Now, you have reached you final destination.